What is the Alabama Research & Education Network? 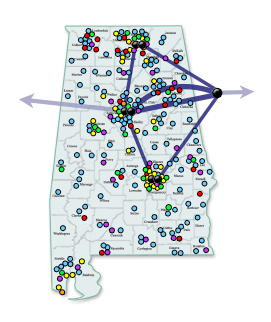 The Alabama Research and Education Network (AREN) is the statewide managed network connecting its clients to the Internet and to Alabama supercomputer resources. AREN currently consists of a multiple ring, 10G Ethernet based network connecting major hub sites in Huntsville (2), Birmingham (2), Montgomery (2), Atlanta, Troy, Dallas, Dothan, and Mobile. Approximately 225 client institutions are connected to AREN, including all public universities and colleges, the state's community colleges, several state government agenies, some public libraries, and approximately 137 public K-12 school systems. For those universities which have an alternate primary Internet service provider, AREN functions as a secondary ISP for local traffic and the primary route for traffic within the state.